Discussion in 'Birthing, Weaning, and Raising Young Goats' started by Ferguson K, Dec 31, 2015. And no l picture, but, Poppy is in isolation. She has explosive runs and it's running all down her legs. Lots of fresh greenery in the nursery and she's reacting to it. She got a dose of probiotic and a drench. Congrats on that HUGE and very beautiful doeling!! Red did you good! Sorry Poppy isn't feeling well. TAH and Ferguson K like this. They're growing so fast. I also just realized I forgot to disbud Haggard.... Oops! Good thing his new owners don't care if he has horns or not, just as long as he is banded. He's going to be a spoiled brat in his new home with one of his brothers. 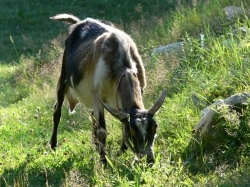 Pet goats; fence clearing goats; and future freezer goats. Hero is such a cutie. I think we're going to keep him. Undecided. Definitely keeping Red's little buckskin doeling. Red has an amazing udder. Definitely keeping Taystee's doeling. Taystee does not have a good udder, but, she's a breeze to handle and her kid is proving to have the same easy temperment. More pictures in a second post coming next. JoyfulGoats, MrsKuhn, Latestarter and 4 others like this. Including pictures of Red's udder here ( post milking ). MrsKuhn, Latestarter, Goatgirl47 and 3 others like this. Holy udder! Those kids are to die for! Thank you! I'm waiting anxiously on the last three does to kid. Any day now. Absolutely beautiful kids! Great pics... I know photography is your thing... so not fair. You need to come take pics of my crew. I mean it would give me an excuse to go see you. Wouldn't you know my easiest does to milk so far are not my does with the largest udders? Karma is so easy on the stand. She stands unassisted. I don't get much out of her, but, Haggard is also already 20 lbs at three weeks. He is emptying her regularly. Taystee is such a dog she just stands there until I take the food away. Aelia has figured out the tote and halter means she gets the good feed. She jumps right up now. Red still needs two people and some reassurance, but, she's getting there. I got two cups from her today before she went nuclear. We calmed her down, have her more grain, and let her go. I want them to end on good notes and not hate being milked. Going to order the udderly EZ in the next two weeks and try that out on her. Samantha drawz, Mike CHS, Goatgirl47 and 2 others like this. They are so cute. I miss not having baby's around. Wow Red has a big udder. Some does , especially those dam raising will put up a fuss... sometimes a full blown "I'm gonna kick til you stop fuss"... they want to hold back milk for their kid. When we pull kids at birth for bottle feeding they are awesome on the stand from day 1. We become their kid. Those that we let dam raise.. no matter how seasoned they still pull those shenanigans. Mike CHS, TAH, Ferguson K and 1 other person like this.